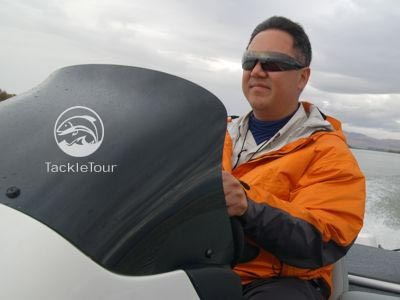 Maui Jim Greets the Fishing Industry with Their Nunui Aloha! Total Score: 8.75 + EDITORS CHOICE! Introduction: Their story began in the early 1980's when they began as a small company selling sunglasses as a beach vendor in Maui, Hawaii. It continued through the 90's when the company was purchased by a larger corporation who then invested the necessary research and development dollars to turn this product into a major player. In December of 1996, Maui Jim, Inc. was born to take full control over their destiny and today, they are one of the most reputable sunglass manufacturers in the world. 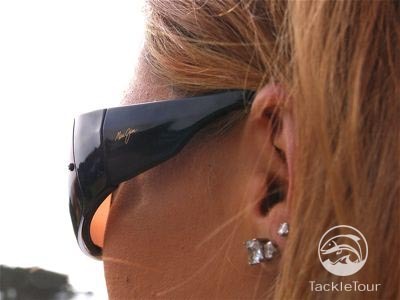 Up until recently, their product focus seemed to be mostly on fashion and casual wear staying true to their roots as beach shades, but as we saw at their display during 2007's ICAST in Las Vegas, they are finally venturing into other arenas as well. Today, we take a look at one of their more promising products intended for those seeking maximum sun and wind protection in their active lives. 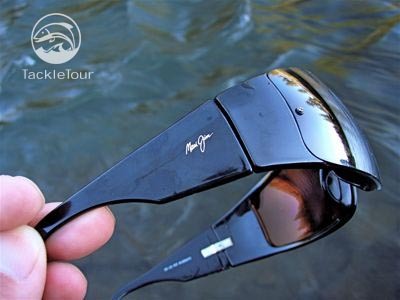 Introducing Maui Jim's Nunui sunglasses. 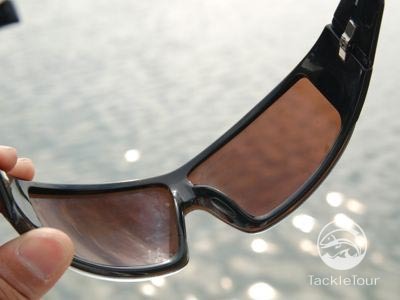 Impressions: I had long admired the product from Maui Jim, but it wasn't until recently, during vacation in the Summer of 2006 that I finally gave in and bought a pair. Believe it or not, the costs had always deterred me. On the occasion of my purchase, I was vacationing with my family on the Big Island of Hawaii and a series of events led me to the sunglass store where I figured ok, it's time. I handed over my credit card to the sales associate and walked out with a brand new pair of Maui Jim Mauna Loa shades for just over $350 - ouch! Those shades were and still are perfect for vacation use, but it became apparent, after several trips on the boat with Zander driving, that they just were not made for high speed activities. Every time we pulled up to a new fishing spot, I had to literally peel my Mauna Loa shades off my face and separate them from my eyes. To say it was a pain is an understatement, but I endured because the clarity of those lenses was unsurpassed in my experience. The side frame on the Nunui is reminiscent of a pair of blinders at first, but are actually far enough back that they're not even noticeable once the shades are over your eyes. Enter ICAST 2007 where the team at Maui Jim introduced me to the new, active sportswear lineup the brand was offering for anglers. My interest was peaked, and several weeks later my Nunui shades were ordered and on their way. The word "nunui" is Hawaiian for "big" and that was the first thought that struck me when I held this product in my hand. These shades seem pretty big! They're quite the departure from Maui Jim's traditional offering of small, featherweight, high styling shades, but once you put the Nunui shades on your face (excuse the pun), it all becomes very clear. 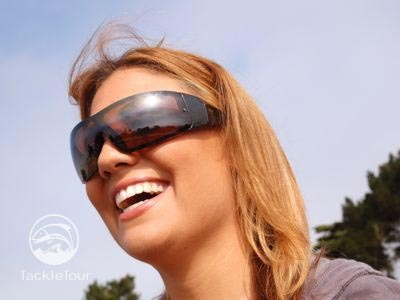 This product is just what those participating in high speed, exposed to the elements sports have been wanting from this company - a true, wrap around style of shades with that Maui Jim pedigree of lense clarity. The Nunui provide good wind protection at speeds of up to about 35 mph. Beyond that, and wind begins to infiltrate over the top and from the bottom. 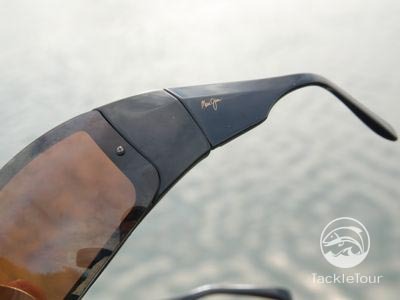 Clarity: Maui Jim Inc. has their own, patented polarization process called PolarizedPlus2 Technology. 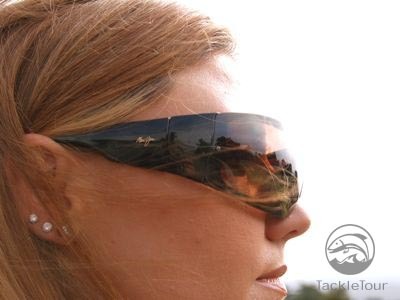 It takes the concept of blocking glare to the next level. 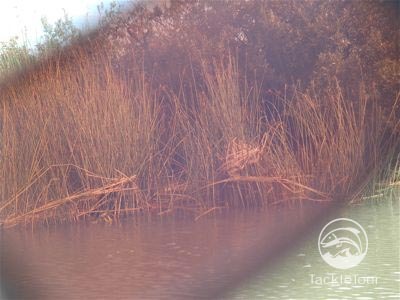 The colors and visual comfort of having their lense over your eyes is why I was willing to endure the torture of trying to use my Mauna Loa shades for fishing. 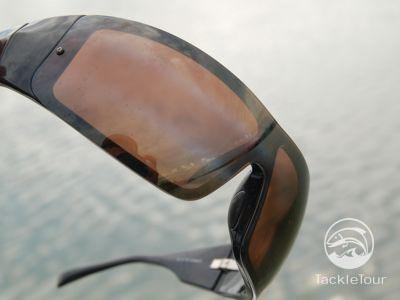 Similar to the growing accustomed to high-end fishing gear, the clarity of the Maui Jims lense is just addicting. But even armed with that knowledge and familiarity, I was skeptical that the Nunui would offer the same benefit as my Mauna Loa shades because the Nunui comes with a polycarbonate lense and my Mauna Loas are glass. Similar to other polarized polycarbonate lenses I've worn and even purchased, I expected the Nunui lenses to have some distortion at the edges. This was simply not the case. These lenses were as clear as my original Maui Jim shades, but even lighter in weight. I was relieved. The Nunui frame is made of Grilamid, a lightweight nylon composite that is becoming more and more common in the sport sunglass marketplace. True to form, it feels like a very durable material. The interesting aspect of the Nunui shades is how the frame material is used behind the actual lenses, and then, the size of the actual frame as it passes over your temple. I expected them to have the effect of side blinders, but again, engineering was superb and I never really noticed the frames once I had the shades over my eyes.